Atishoo and Bless You! 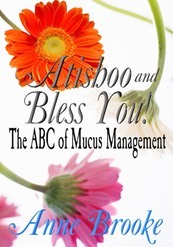 The ABC of Mucus Management is published at Amazon by Anne Brooke Books. Sinusitis? Catarrh? That awful feeling of nausea? Yes, you've got the dreaded problem of mucus. It's nasty and debilitating and nobody seems to want to talk about it, but don't worry, as you're not alone! Written by a fellow-sufferer, The ABC of Mucus Management takes you through a series of suggested remedies, tips and tricks to manage your sinusitis and catarrh issues. It will help ease your discomfort, shorten your period of illness and prevent your next attack. Atishoo and bless you!